Usually associated with tropical locales, there are some varieties of cold-hardy hibiscus (Hibiscus) that produce colorful blooms. Hibiscus are usually shrubby perennials with glossy, green leaves and round, delicate, vibrant flowers. When planting in colder climates, hibiscus should be protected in winter and, in some cases, cut back. The most hardy hibiscus can survive to minus 10 degrees F. Hibiscus plants flower in the summer in cold-weather regions, and may bloom until the first frost. These plants thrive in full sun with regular water. Confederate rose (H. mutabalis) is hardy to about 20 degrees F and grows as a perennial shrub in colder climates. In coldest regions, this hibiscus should get winter root protection in the form of additional mulching. 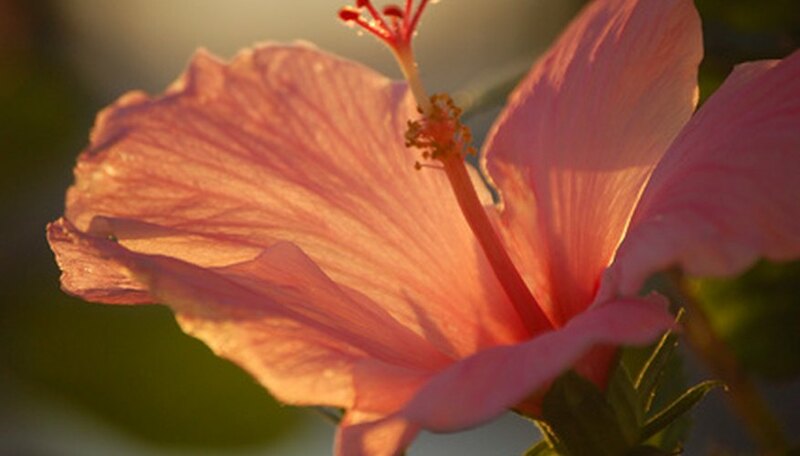 This variety of hibiscus has oval-shaped leaves with three to five lobes and produces flowers of up to 6 inches in summer. Most often available with single blooms, some double-bloom cultivars exist. The blooms on the Confederate rose are usually white or pink in the morning, but change to deep red as night approaches. Also known as perennial hibiscus, the rose mallow (H. moscheutos) has the largest blooms of any hibiscus. Available in many colors, including whites and reds, blooms may be up to 12 inches wide. The Rose Mallow is hardy to about 0 degrees F, but does die back when winter sets in, even in milder climates. This plant should be protected from wind. The rose mallow has oval, toothed foliage that is green on top and white underneath. Blooms on this plant, which can grow to 8 feet, appear in late June in most regions, and may continue to first frost. The Rose-of-Sharon (H. syriacus) is also known as the shrub Althaea, and is hardy to about minus 10 degrees, but should be cut back and protected with mulch in the coldest climates. The Rose-of-Sharon can grow to 12 feet and may be trained as a topiary. This hibiscus produces blooms of up to 3 inches, in colors ranging from purple to pink to red to white. This hibiscus may have single, semi-double or double blooms and will drop its leaves without changing color as cold weather sets in. How Tall Do Hibiscus Plants Get?